We have really seasoned roof cleaners who could bring your roof back to perfect condition in no time. 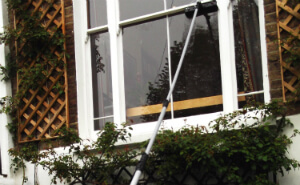 They use highly effective pressure washing equipment as well as telescopic poles that could eliminate mildew, lichen,algae, icky spots and moss from any roof. This will help to make your property look much better, and will keep it protected from destruction from all the potentially harmful growths on it. You may save lot of money for repairs, by choosing our service. We will ensure that your roofing is nice and clean and we are going to do it at a very reasonable price. If you require support with the cleaning of your gutters, your roof or your outdoors windows, do not hesitate to book our top quality cleaning services today! Proper gutter cleaning must be done at least once a year to avoid clogging of the gutters and downpipes. Ashlee House Cleaning can provide you with reliable and quality guaranteed gutter cleaning. The gutter cleaners are well-trained to use the professional dry or wet vacuum cleaners and telescopic poles to reach to any debris. Small cameras installed on the end of the poles allow the cleaners to see and remove all leaves, twigs and other residues. You will be provided with before and after photos of the condition of your downpipes and gutters. We offer our customers a quality guarantee of 1 month for this service. We have a straightforward reservations system for our window cleaning The Hyde NW9 services. You could reserve any day of the year for your window, roof or gutter cleaning. We can come on the same day in case you want an urgent service. We have fixed and reasonable fees. All customers who book more than 1 of our services altogether will be given a discount for every additional service. No advance payment is needed to order our cleaning services. We have advantageous fees for regular clients, real estate companies, property managers and for those of you who book early on. For a professional window cleaning service, do not be reluctant to get in touch with our 24/7 customer care service now at 020 3746 1366 or via our web based booking form. You will receive written confirmation in the next Two hours.